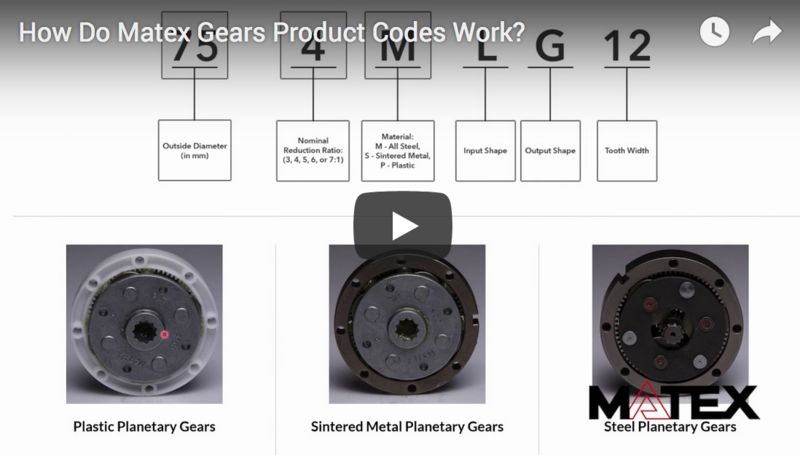 How Does Matex Products Code Their Planetary Gears? We'll be looking at the graphic (above) to discuss how planetary gears product codes work. The first box is always going to represent the outside diameter of the gear. We have them ranging from 26mm up to 200mm. In this case, the 75 represents a 75mm OD (outside diameter). The second box, is always going to be the nominal reduction ratio and we carry that in 3,4,5,6, and a 7:1 ratio. The next box represents the input shape. We have several different input shapes. It could be a female input shape of several different varieties or it could be a male serration itself. The next box is always the output shape. This is how you're going to interact with the carrier plate. We carry several different sizes of that, depending on your torque needs and we have them so that they are available to fit together. If you guys want to learn more about how to find the planetary gears product codes and you can use this video, fast forward it, rewind it just to really understand the planetary gears. Once you get the hang of it you should be able to match up the planetary gear that will work for you!